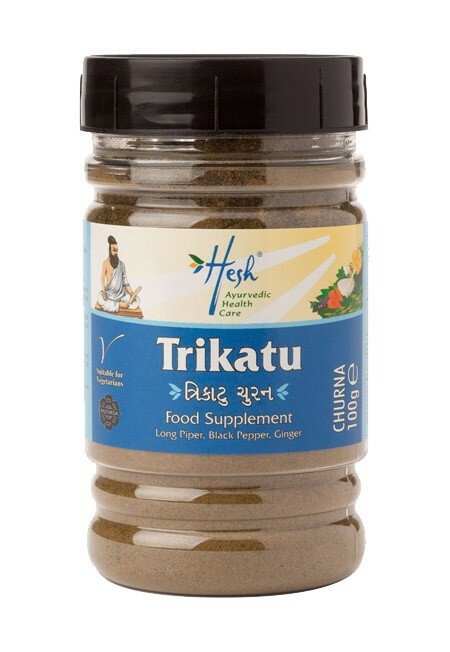 Trikatu means 'the three pungents' and it is used to help maintain a healthy respiratory system. Ginger, black pepper and long pepper are mixed together to stimulate the system, warm the digestion and improve assimilation of nutrients. It is traditionally used for lung and nasal problems. It is specific for allergic rhinitis, hayfever and colds. It is used in Ayurveda as part of a weight loss regime to increase metabolism, digest fats and balance appetite. It is traditionally taken with honey. Long Pepper (Piper longum), Ginger (Zingiber Officinale), Black Pepper (Piper Nigrum). Don't use if you have hyperacidity or ulcers. Caution in pregnancy. 1 teaspoon, twice daily with warm water & honey.